Book 4 of "Psalms of Isaak"
SYNOPSIS - Ken Scholes's debut novel, Lamentation, was an event in fantasy. Heralded as a "mesmerizing debut novel" by Publishers Weekly, and a "vividly imagined SF-fantasy hybrid set in a distant, postapocalyptic future" by Booklist, the series gained many fans. It was followed by Canticle and Antiphon. Now comes the fourth book in The Psalms of Isaak, Requiem. Who is the Crimson Empress, and what does her conquest of the Named Lands really mean? Who holds the keys to the Moon Wizard's Tower? FL Speak - Probably one of the best books in the series. Everything is moving at a rapid pace towards a conclusion. It's not there yet but the plots within plots are revealed anew and the key players emerge from their shadowy places. What began with the fall of Windwir was not the beginning. The plan was set long ago. Long before these charismatic men and women were born. But even the best-laid plans are as good as the intentions of those who follow it. Requiem is truly the story of Neb, of Rudolfo, of Vlad, of Jim and of Isaak. 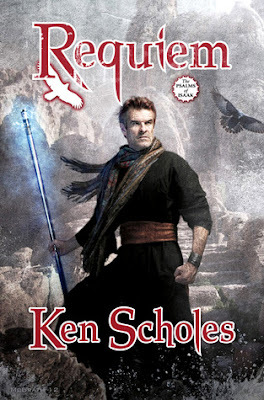 Ken Scholes wonderfully bridges a far-reaching quest of destiny and connects it with political intrigue and war campaigns. Filled with revenge, blood-letting, dream sequences and a lot of running and flying, this wonderful tale of fables and legends carefully fills the gaps between myths and facts. By the end of book 4, we know there's more to the Named Lands than the people living in it. We also know the people on the moon and that the desolation of Windwir was just one of the many that ended civilisations and history. This is a grand war for the survival of humankind. Because if the Crimson Princess were to rise, the land of living will return to the Dark Ages.